This wonderful adventure starts in Las Vegas with colorful trivia on the beginnings of Las Vegas, its mob roots and the wild and woolly early days of this pioneer town. The tour stops at the magnificent Hoover Dam for views, photos and an oratory on this icon in the desert. Continuing south you will pass the famous and beautiful gold mining area known as Eldorado Canyon, once the richest gold mining area in the world. Your next stop is the Sante Fe Railroad Train on the famous Route 66 in Kingman, Arizona. The scenery and rock formations around Kingman are truly stunning and were the backdrop for many movies of the Western genre. 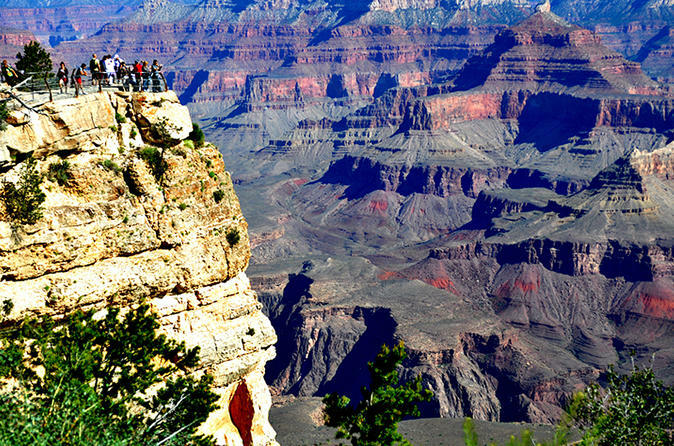 You will then proceed to one of the most awe-inspiring places in the world, Grand Canyon National Park, where you will spend 3 full hours. You have the option to walk without your guide and have a romantic picnic along the 2.5-mile paved rim trail, considered by many to be one of the most beautiful walks in the world.